As I strive to squeeze the most from every set, I’ve done considerable thinking about what number of repetitions is most challenging. Put another way: When doing a set to failure, what number of reps hurts the most? I’ve analyzed only sets consisting of 1-10 reps; if your set lasts more than 10 reps you’re doing glorified cardio. My comments below are ordered from easiest rep range to hardest. 10. Four: A four-rep set isn’t heavy enough to be a vessel-popping lift. It’s also not light enough, nor long enough, to leave you gasping for air at the end of your set. I’ve fallen into a four-rep set when I overestimate my strength and grab weights that are just too heavy. At four, you won’t achieve the muscle-building benefits of higher reps, and you don’t get the gut check that comes from lifting even heavier weights. 9. Ten: I don’t believe for one second that everyone’s muscles fail magically at exactly 10 reps. You picked a weight that was too easy; you decided before you began your lift that you would call it quits at 10. 8. Two: Something has gone wrong here. A two rep set is either a max lift too light, or a well-intentioned set that became too heavy. 7. One: To be honest, I’ve never done a one rep max lift. They’re crazy unsafe, and pretty much decoupled from muscle size or fitness. (Don’t believe me? 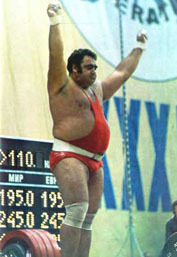 Here is a photo of legendary Russian weightlifter Vasiliy Alekseyev. And then there’s Naim Suleymanoglu, the Turkish weightlifting phenom who between rounds at the Olympics ducked outside for a smoke.) Even though I’ve never done a one-rep lift, I have hoisted many heavy things once, like couches, folding tables and hide-a-beds. For sure, pushing your body to its physical limit requires a massive mental effort. I am also sympathetic to the perspective of American female weightlifter Cheryl Haworth – she said that weightlifting is unique among competitive sports because hard training never makes the workout easier: any milestone lift is quickly buried under the weight of your next heavier attempt. Regardless, at the gym, the typical one-rep lift is an exhibition in poor form. It’s also an intense workout for some unfortunate spotter. 6. Three: Triples are used predominately as a warm-up for singles. The whole set probably takes about 10 seconds, and is more an ego-booster than a killer lift. 5. Five: To me, five is a failed effort to get to six, the absolute bottom of the mass-building range. The effort required to move such a heavy weight five times is impressive, but ultimately nothing meaningful has happened. 4. Nine: An honest effort – you were shooting for 10 but reached failure first. Nevertheless, you’re going too light: As you re-rack the weight you find you’re more winded than exhausted. 3. Six: Six reps is a major accomplishment. Still, the set doesn’t last long enough to leave you worn out. You finish the set feeling pumped and strong, not dizzy and drained. 2. Seven: My most memorable lift was seven reps: a bench press with 115 lb dumbbells. You can make a career out of seven reps. Nevertheless, there’s one rep left if you want to achieve perfection. 1. Eight: The eighth rep is the place to die. Eight reps means the weight is heavy enough to build powerhouse strength, but the reps are high enough to pack on the mass. This set isn’t about ego but about serious training, making the most of your time in the gym. A solid set of eight will leave your cardiovascular system stressed, your muscles sore, but your mind content. This entry was posted on Thursday, November 20th, 2008 at 3:29 pm and is filed under Motivation. You can follow any responses to this entry through the RSS 2.0 feed. Both comments and pings are currently closed. These powerblocks are flipping great! They have helped me get alot bigger. I adore them! Just read a eye-opening story about a dozen guys on a football team that all ended up in the hospital with “”compartment syndrome,” which caused soreness and swelling in their triceps and high levels of creatine kinase, a protein that can harm the kidneys. Three players had surgery to relieve swelling.Authorities said the cause was not yet known, but the condition can be the result of exercise or the use of certain medications. All but one of the players who became ill worked out last Sunday at the high school’s wrestling room, where one player says the temperature reached 120 degrees.” What a bad decision that was by the 1st year coach.For all my members at Killer Abs please be judicious and proceed slowly if you have not been exercising in a while. If you take too much of a jump up in your exercise routine, your body will break down a lot of muscle at once. The result will be the release of too much broken down muscle particulates into the blood stream. This can clog the kidneys and cause Rhabdo.